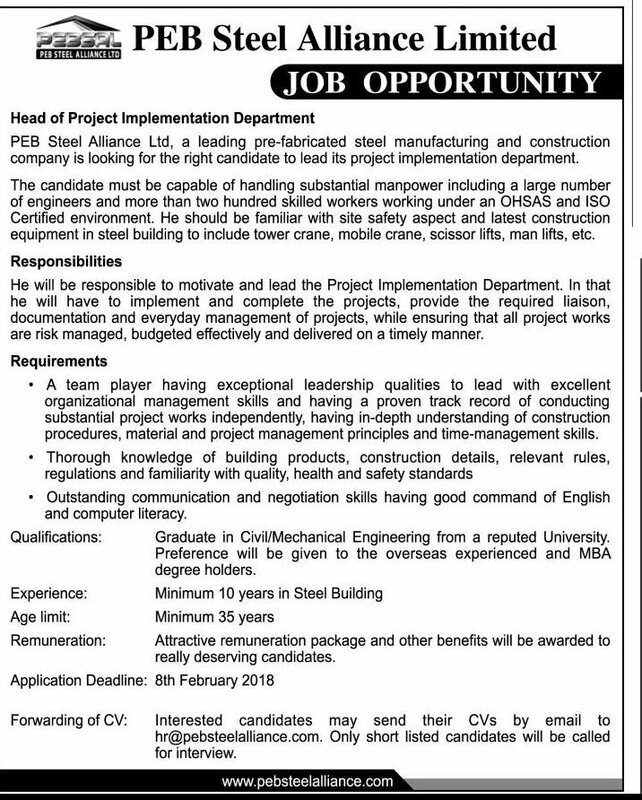 PEB Steel Alliance Ltd Job Circular 2018 has been published.If you are looking job then you can apply for this job offer. Maximum, unemployed people can not find a good job, in this case, PEB Steel Alliance Ltd Job Circular 2018 is too much important for the unemployed people. This job circular only for him, Who can perform in the marketing department. This job circular is the most important and valuable thing in success in life. PEB Steel Alliance Ltd. (PEBSAL) is a Joint Venture (JV) between PEB Asia Ltd (Vietnam) forming the foreign component while Alliance Holdings Limited, an investment holding company having presence in the Infrastructure (Dry Port), Carbonated Soft Drinks, Ready Made Garments, Real Estate, Agribusiness and Media and Nekan Engineering Limited, a nationally renowned company for erection of Pre-engineered building on turn-key basis are the local partners. PEB Steel Alliance Ltd. (PEBSAL), specializes in the Design, Fabrication and Erection of pre-engineered steel buildings (PEBs) for factories, warehouses, showrooms, commercial/ trade centers, supermarkets, sports stadiums, exhibition halls, aircraft hangars, etc.PEBSAL, product range includes Pre-Engineered Building as well as curved roofs, castellated beams, open -web – joists, and special trusses.PEBSAL, fabrication facilities boasts a capacity of more than 36,000 metric tons of complete pre-engineered buildings anually. This enables PEBSAL, to deliver its buildings in a very short time.